You Say Spelling Makes Sense? Show Me. A new group of fifth graders. A promise to prove that that spelling makes sense. An introduction to the matrix. The evidence begins stacking up. 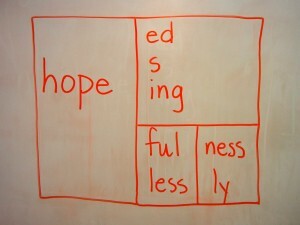 Our mission today was to build a matrix using the base word <hope>. 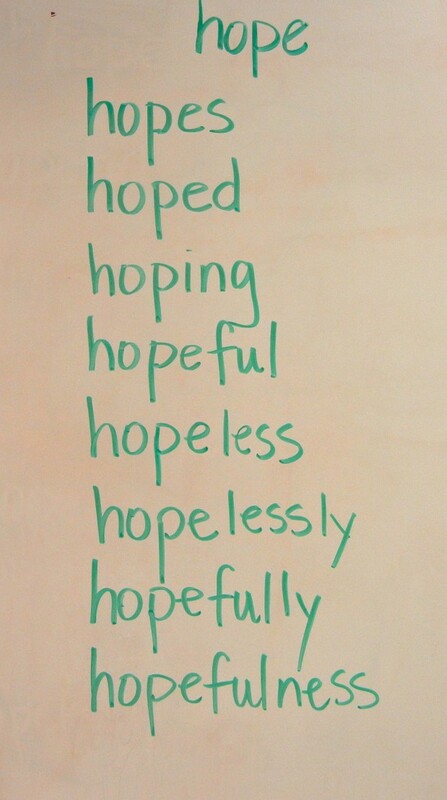 I began by asking students to suggest words built from that base. Here is the list we ended up with. Next I moved to a clear area of the board and wrote the base word. I spelled it out loud as I wrote it. 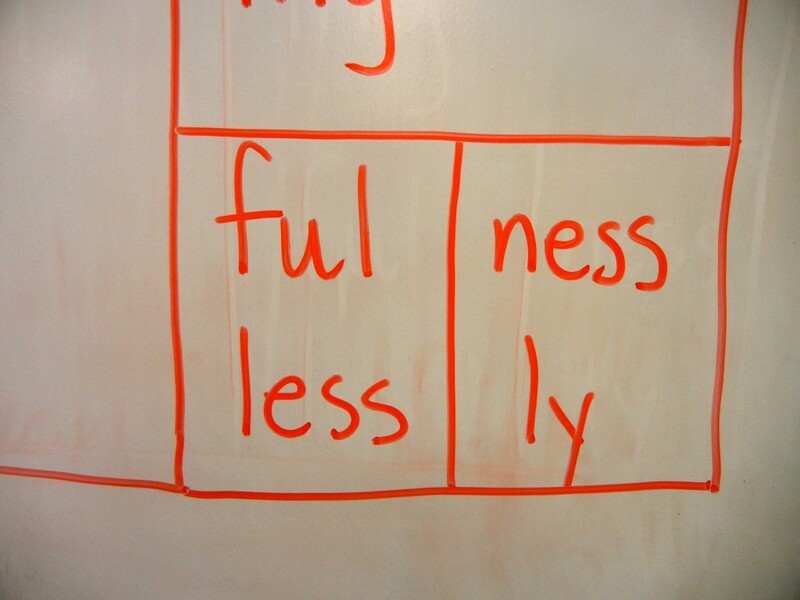 I told the students that when working with words on a matrix or in a word sum, we always spell out the base and the affixes. The look on their faces told me they needed to know why. I moved to the side and wrote the base <sign> on the board. I said, “This is a free base. It is a word by itself. It does not need an affix to be a word. If it is used all by itself, how is it pronounced?” The students read it as you might expect – /saɪn/. 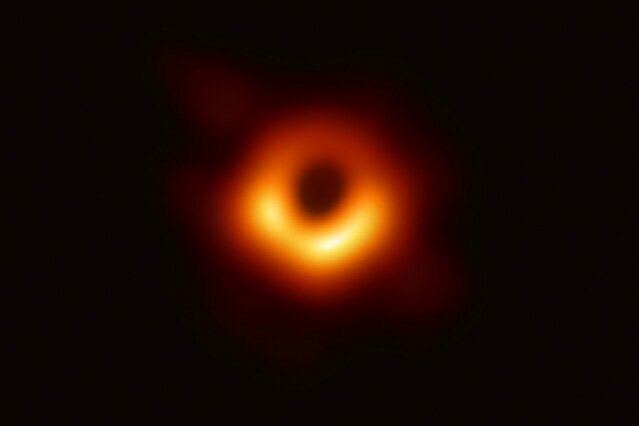 Then I wrote the following word sum: <sign> + <al> –> signal. I said, “Look carefully at what I did. I added a suffix to the base <sign> and the pronunciation of the base changed! 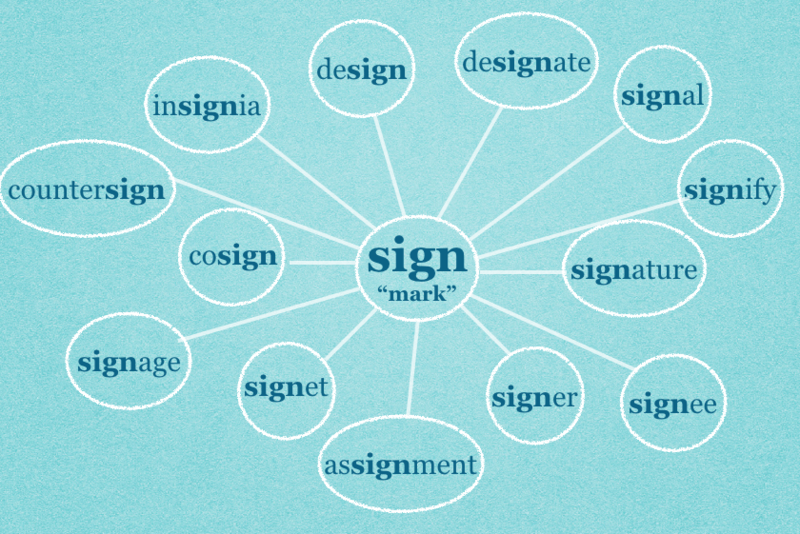 In the word <sign>, the <g> represents no sound at all. In the word <signal>, the <g> represents /g/. Now look what happens when I add the prefix <de> to the same base.” I wrote the word sum <de> + <sign> and asked someone to tell me what word we just made. The students now had a look of understanding on their faces when they read the word <design>. The pronounced /s/ in <sign> was now a pronounced /z/. Three words. 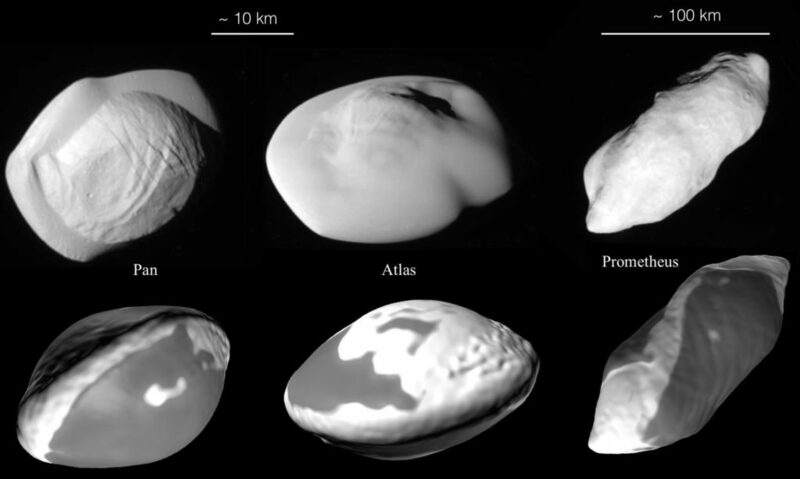 Three different pronunciations of the base. No change to the spelling of the base. We must spell out morphemes until our word is finished. Then we can look at pronunciation. Now I went back to building our matrix. I asked for suffixes that could be added directly to our base. 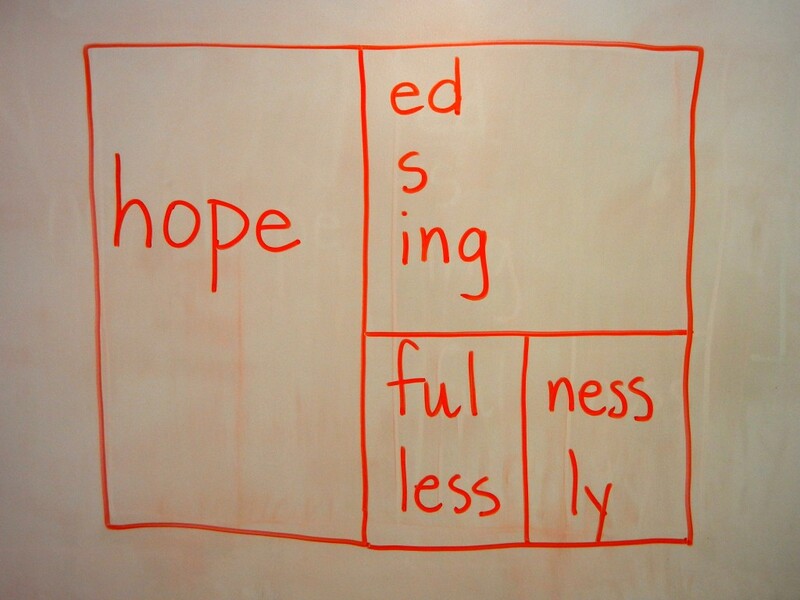 Students suggested <-ed>, <-ing>, <-ful>, <-s>, and <-less>. I arranged them in a column since they could all be added directly to the base. On the matrix you can see that I drew a vertical line to separate <-ful> and <-less> from <-ness> and <-ly>. That is to show that <-ness> and <-ly> would never be added to the base directly. 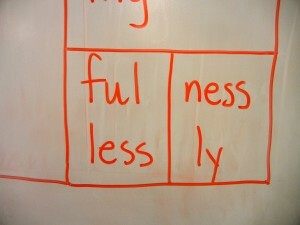 They would only be added to the suffixes <-ful> and <-less>. 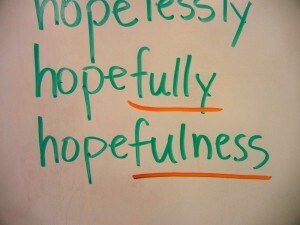 In this way we can make the words <hopeful>, <hopefulness>, <hopefully>, <hopeless>, <hopelessness> and <hopelessly>. The horizontal line is drawn separating <-ed>, <-s> and <-ing> from <-ful> and <-less> because the suffixes <-ness> and <-ly> cannot be added to the top three suffixes. Next it was time to talk about writing word sums. 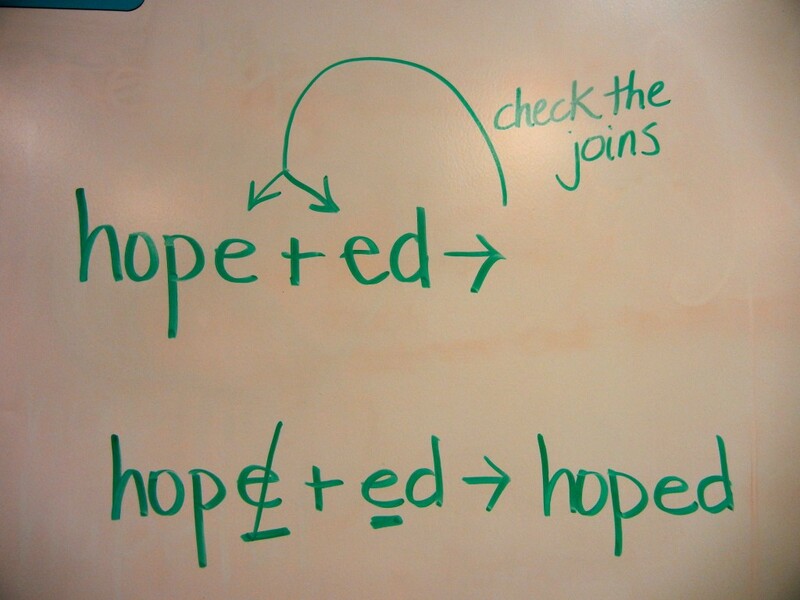 What you see below would be read as, “h – o – p – e plus e – d is rewritten as (check the joins) … [at this point the student pauses and checks the places where the two morphemes, in this case a base and a suffix, are being joined. Because we are adding a vowel suffix, the <e> in <-ed> will replace the final <e> in the base. The final <e> in the base then gets crossed out and the reading out loud continues.] … h – o – p – (no e) – ed.” It’s important to say “no <e>” because in doing so we are acknowledging that the final <e> on the base is being replaced. 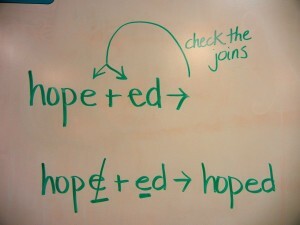 The student realizes it is part of the base, and when deconstructing the word <hoped>, that final <e> needs to resurface. The plot thickens and so does the understanding. Next I posed this question to the students. 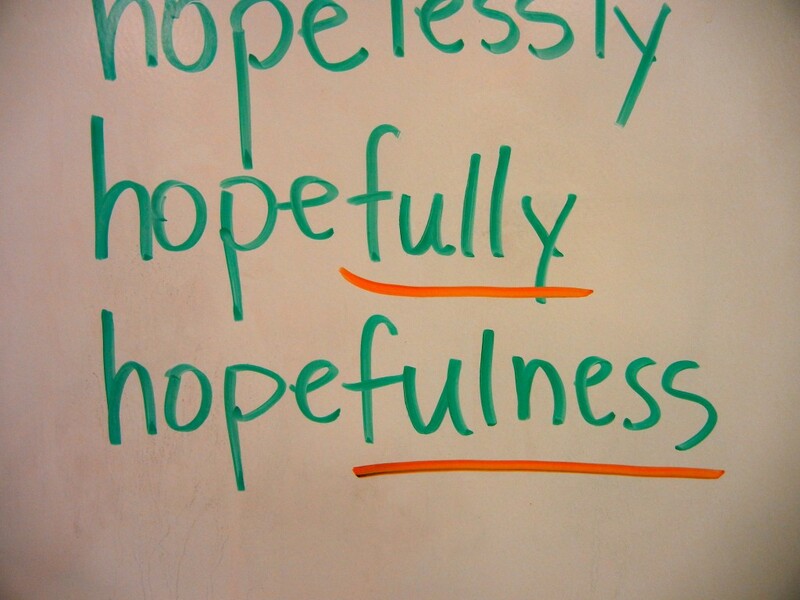 “Why is there only one <l> in <hopefulness> and two in <hopefully>? There was no hesitation. Using the matrix, the students easily explained that there was one <l> in the suffix <-ful> and one <l> in the next suffix <-ly>. This year I had a high school student who came to my classroom every day to help out. 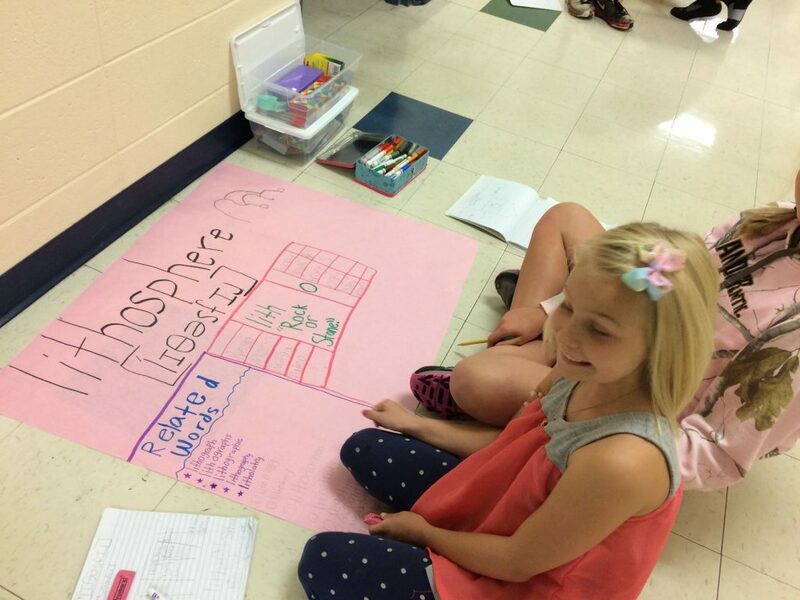 The other day while she was here, two 5th graders shared their poster about the digraph <wr>. They were listing words that began with <wr> and had something to do with twisting and turning. (Wringing, wrench, wrinkle, wrist, …) After the bell rang and the 5th graders left, she turned to me. “Every time I’m in here and these students present like this, I am blown away. 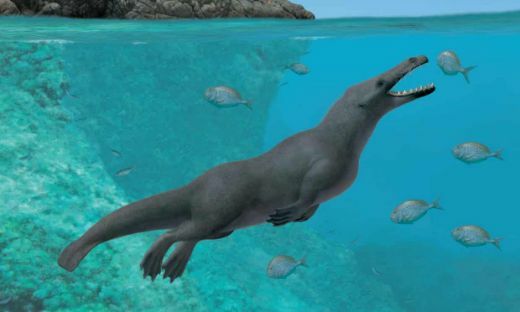 This stuff is so cool and interesting! 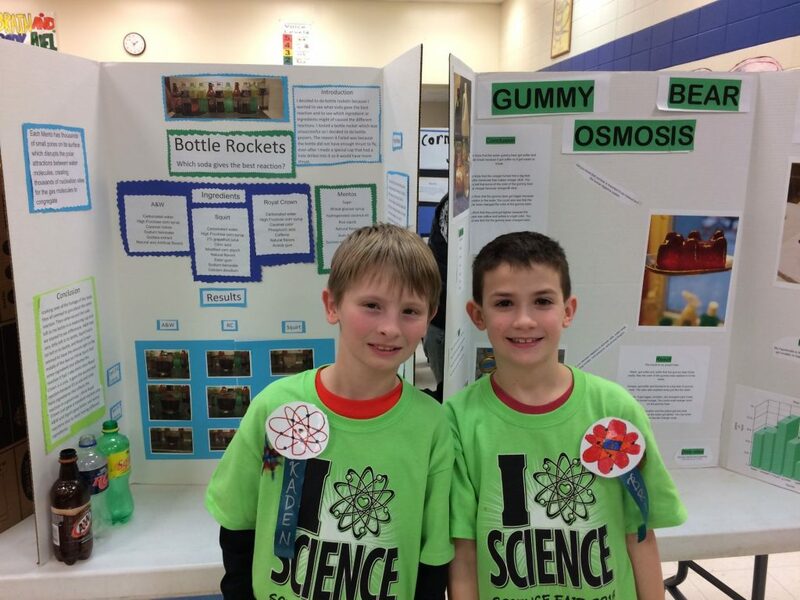 Do they have any idea just how lucky they are to be learning this stuff?” I had to admit that I’m not sure my students realize how unique their situation is. ~Orthography makes spelling less complicated. ~I used to just write the word. I didn’t know nothing about the word or the base of the word. Not even the prefixes or suffixes. Some words are hard to understand, but this way helped me. ~I learned that the <carn> in carnival has the same meaning as the <carn> in carnivore. ~Syllables are not word sums. ~Orthography is not just learning the meaning of a word. ~Instead of learning how to spell words we learned their history and how they were made, allowing us to sort of understand what they mean. ~Word sums are not found in a dictionary. ~Yes! There were no spelling tests! 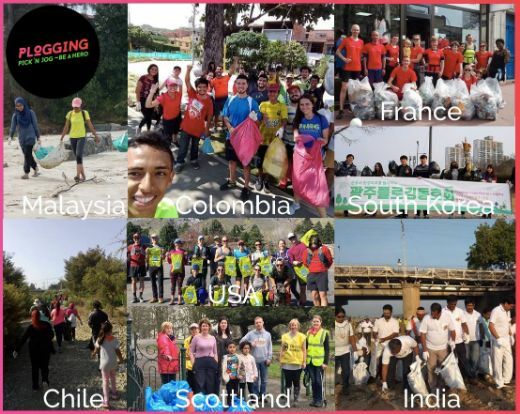 We worked on something new almost every day! I now know new and harder words. ~I don’t like spelling, but I like orthography. ~Words have connections to other words that we don’t always recognize. Example: lavendar and lava. ~It helps me because I can remember the morphemes, and they help me remember how to spell the word. ~Lots of words have histories and were spelled different back then. ~Words have not just one meaning but multiple meanings. ~Back when some words were spelled a little different, they also had meanings that were a little different than their meaning today. 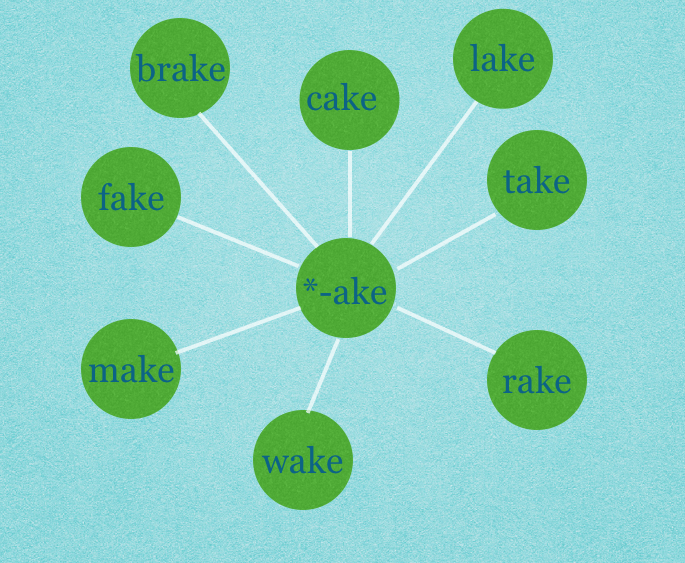 ~Orthography helps you find bases so you know if the words have something in common like in sign and signal. 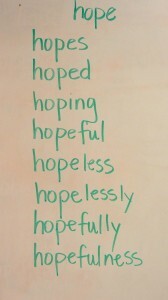 ~I liked this more than spelling because it had more thought in it rather than just memorizing the spelling of a word. ~There is actually a reason words are spelled the way they are. ~I always used songs to remember how to spell words. Now I just need to break them down into morphemes and I can spell the words I don’t know. ~In the past we’d just get words and the teacher would be like, “Make sure to study!” But none of us did. Now we don’t have to study. It just kind of sticks. I can spell much better. 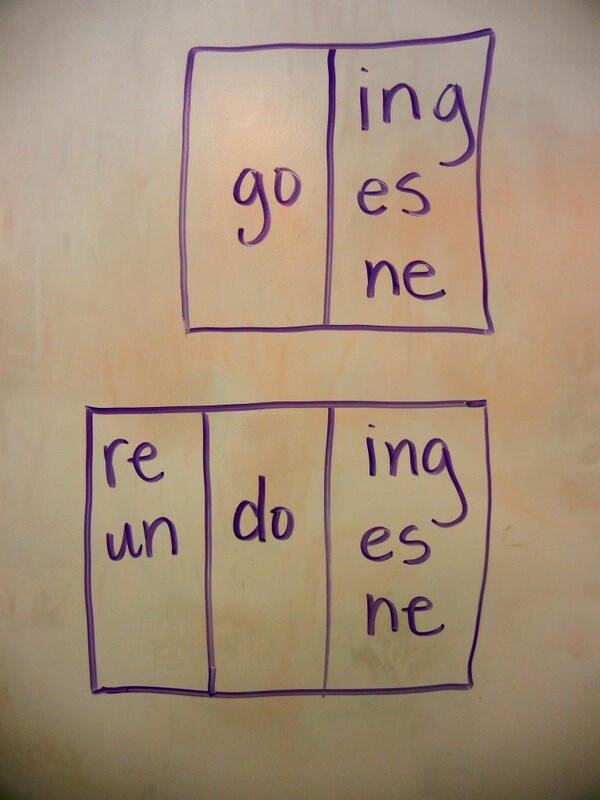 Syllable Use Helps With Spelling? Not Likely! I walked into a classroom last week and had an opportunity to really and truly understand how breaking words into syllables does not help students learn spelling. Let me explain. 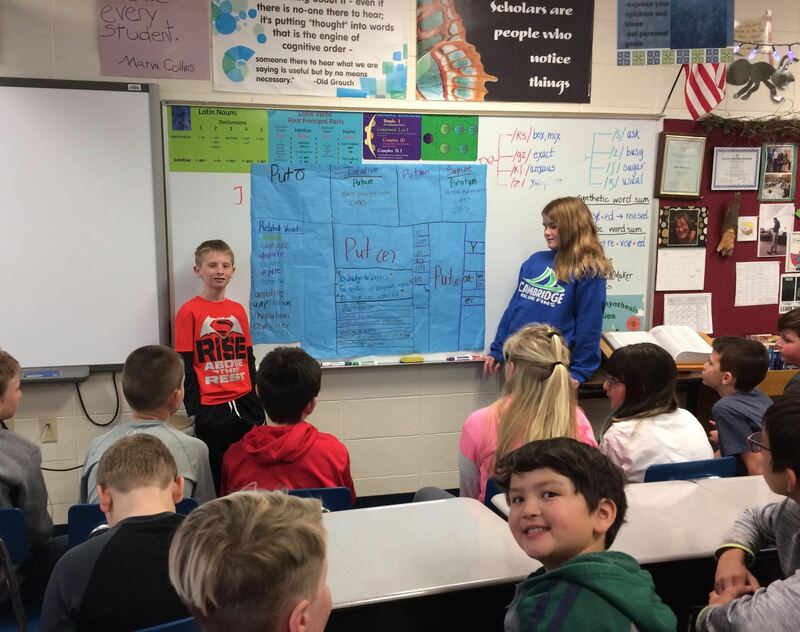 The lesson was focused on the base word <male/mal>. There were 10 words written on the board and they were all divided into syllables to aid in pronunciation. I asked if pronunciation or meaning was the most important thing this teacher wanted her students to know about these words. She said meaning. I tried then to point out that by breaking the words into syllables, she had disguised the word parts (morphemes) that HAD meaning. Here’s an example using the word <malevolent>. The syllable breakdown on the board was <ma + lev + o+ lent>. So how hard have we as teachers just made it for the students to recognize that one of the base words here is <mal> which means bad … or that the other one is <vol> which means will? Instead of a syllabic breakdown I would suggest an orthographic word sum that looks like this: <mal> + <e> + <vol> + <ent>. 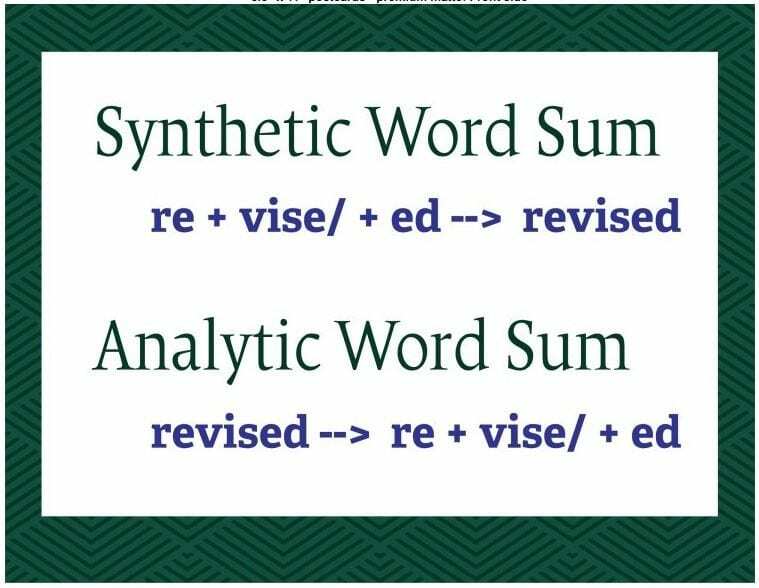 In an orthographic word sum, the word is separated into morphemes (a word part with meaning that cannot be made smaller). With this kind of examination, the students will learn several things. 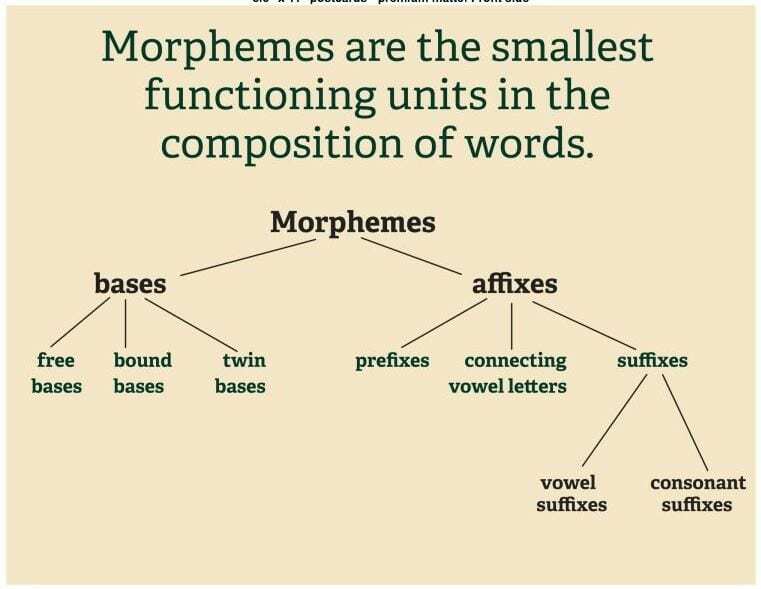 First, once they have researched this word, they will find the meaning of it — not just the general meaning, but the meanings of the morphemes <mal> and <vol>. 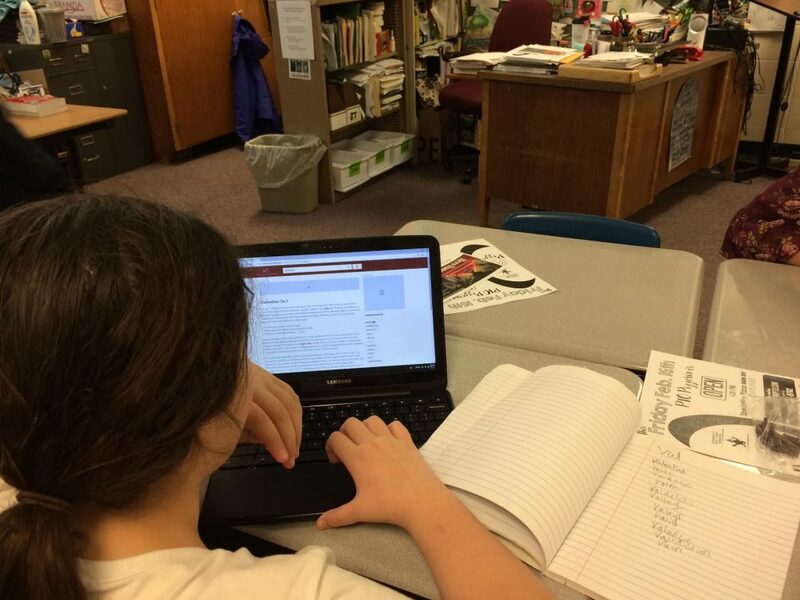 While researching (using Etymonline), they will also learn the history of the word and these bases. With teacher guidance they will learn about the connecting vowel <e>. 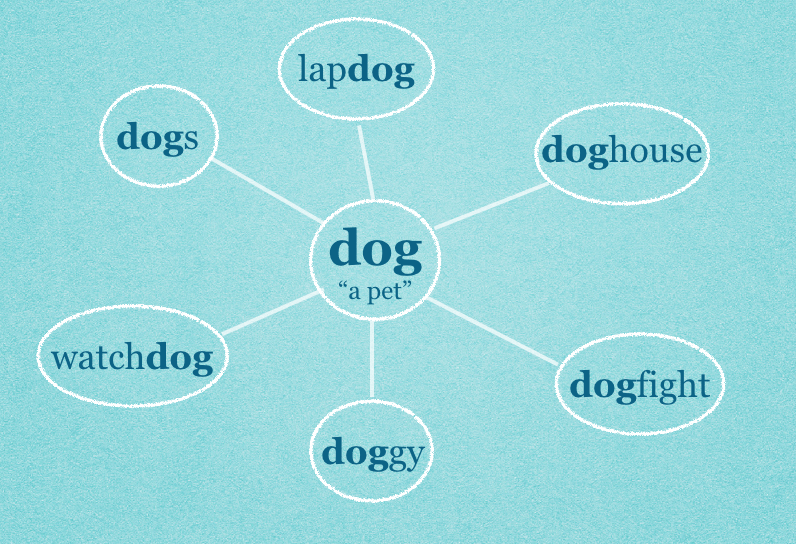 They learn that with two bases in one word, this word is a connected compound (meaning it is a compound word with a connecting vowel between the bases). Lastly the student will recognize that <ent> is a commonly used suffix (based on previously investigated words with that suffix and also a list of words compiled by students in which <ent> is clearly the suffix). 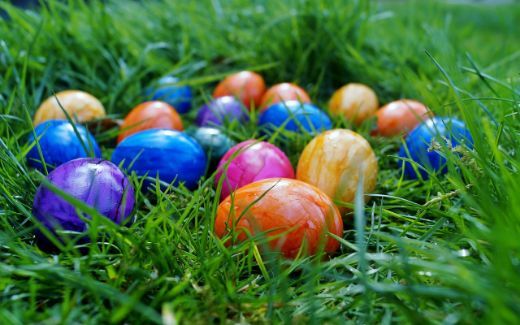 By separating a word into syllables, the suffix <ent> is not recognizable because it is visually paired with an <l>, forming a familiar word <lent>. None of the syllables in the word <malevolent> have meaning. They do not enhance a student’s understanding of what the word means. 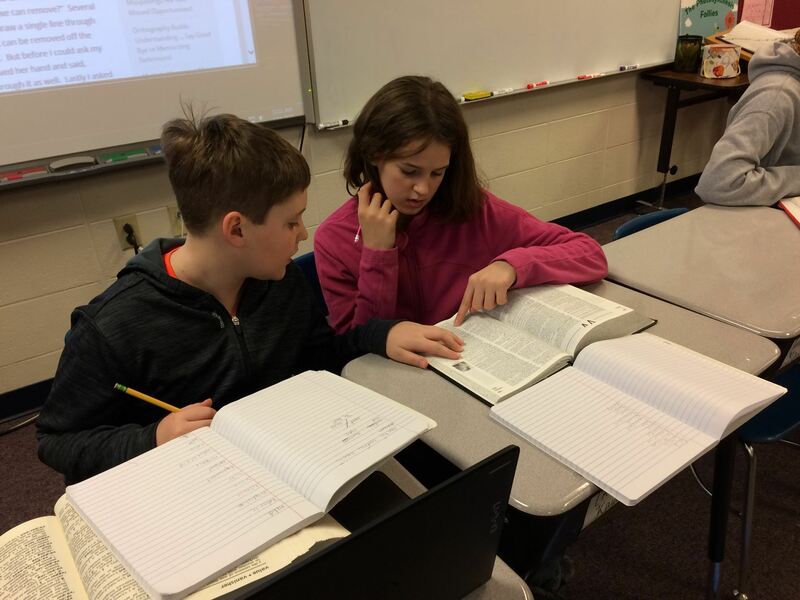 What if … instead of having students break words into meaningless parts that may or may not make the rote memorization of the word easier, we have them break words into meaningful parts that the student can then relate to what they know of other words and other spellings? 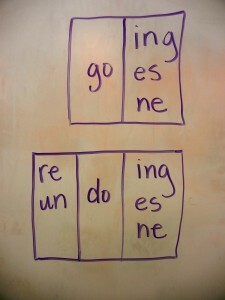 Gina Cooke referred to this process as peeling back the layers of a word in her video called “Making sense of spelling“. 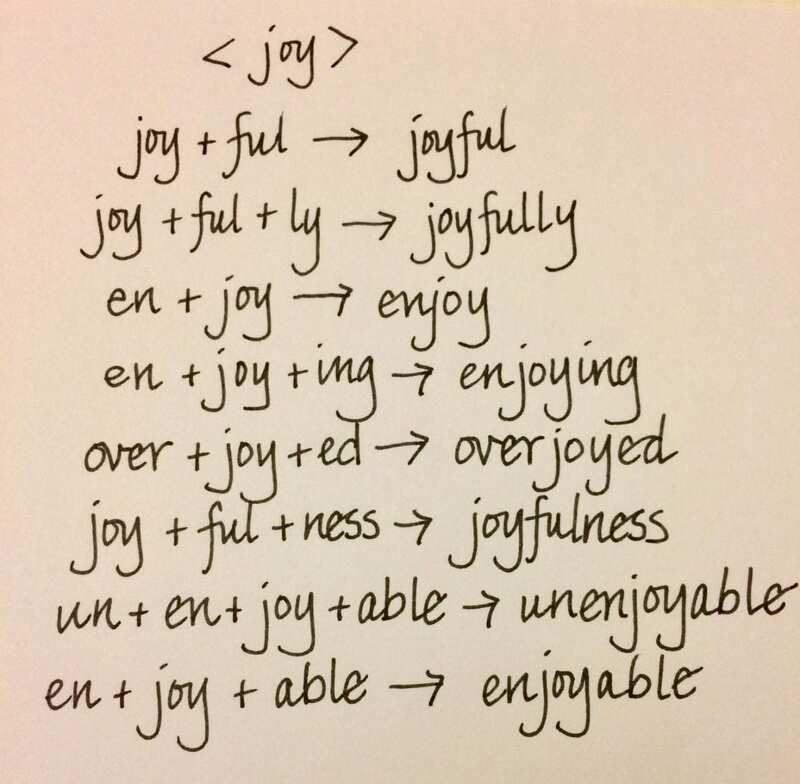 What a beautiful way to think about a word and its affixes. Initially, the teacher said that she wanted her students to be able to pronounce the words. Teaching the students IPA (International Phonetic Alphabet) would be better suited to this end than syllables anyway.